On Twitter, in the streets, and on campuses around the country, Angus Johnston is working to build and support progressive organizing in America. If you'd like to lend a hand to help defray his expenses, here's where you can kick in. All money received will go first toward buying and giving out more stickers to meet ongoing demand, and then to underwriting whatever project Angus comes up with next. Oh, and if you'd like to request stickers, click here . Continuing to plow my way through the requests, getting closer and closer to being caught up. Ordered 6,000 more stickers this week, which means that by about two weeks from now I should have completely cleared the backlog. If you have ordered, but haven’t received your stickers, check back in a bit—I’ll post again when I’m completely up to date, and you can nudge me then if your order went missing. And again, thank you to everyone who’s contributed to the project—you’ve made this possible, and are making it possible to continue. I'm raising the goal of the project again, by the way. It's become clear that this is going to be an ongoing thing, and I don't want to be constantly fiddling with the numbers, so I'm raising it a lot now with the assumption that I'll leave it alone for quite a while after that. Hi, all! 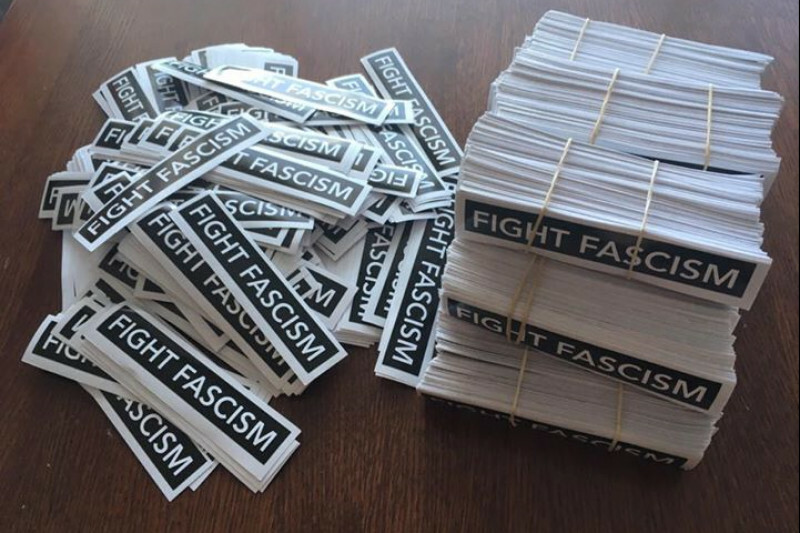 We've received more than two hundred requests for stickers just this afternoon, and thanks to everyone's generosity I just put in an order for more from the printer. That's a total of five thousand stickers so far. So thank you to everyone who donated! This is turning into something really cool. I gave away all my stickers and I need more! Fascism is on our doorstep! It must be stopped! 1934 NYT article "Urges Good Will by Jews for Nazis" was an interesting find! Re: "Some Thoughts for Civil Libertarians on Fighting the Far-Right on Campus" - it's a shame there's no free speech defense group for students. SUNY can be downright vicious in attacking students at times. Nancy Zimpher was ok with SUNY officials speaking in lofty terms about the free speech rights of the Westboro Baptist Church, while also ok with SUNY officials threatening students who report academic dishonesty, sexual harassment, and retaliation.